In 1989, the year of Lucille Ball's passing, the vice-president for CBS Video was searching for some Christmas programming for video release. While working on this project, he learned about I Love Lucy's seldom seen "Christmas Epiisode." The episode was originally aired on December 24, 1956, during the sixth and final season of the series. It was never included in the package of 179 episodes for syndication because of its Christmas theme and its lengthy flashback scenes. Back in 1956, it made perfect sense to compose an episode of flashbacks from past shows. When I Love Lucy premiered in 1951, television was still a novelty and many North Americans did not own a television set. By 1956, when the Chrismas episode was broadcast, the number of TV owners had increased dramatically. Thus, the flashback enpisode provided viewers with an opportunity to watch scenes from earlier shows for the first time. As soon as the little boy is sound asleep, Fred and Ethel Mertz arrive with a Christmas tree. It's an unimpressive five dollar fir. Referring to her cheapskate husband, Ethel proclaims that it's "a gift from me and Ebeneezer." The Ricardos and the Mertzes begin decorating their Christmas tree and Lucy notices an uneven branch. Fred saws the branch while Ricky tells Lucy how the birth of Little Ricky has changed their lives. They reminisce about the day that Lucy told Ricky the news that she was having a baby while he was performing at the Tropicana (flashback from "Lucy is Enceinte"). Meanwhile, a distracted Fred cuts off too much of the tree while listening to all the reminiscing. He leaves to find another tree. During his absence, Ethel and Ricky break into a rendition of "Jingle Bells." Lucy joins in with her off-key singing. They are reminded of the time she sang "Sweet Adeline" as part of their barbershop quartet (flashback from "Lucy's Show Biz Swan Song"). Fred returns with a tree he got "last minute" for 50 cents and they all begin to decorate the new tree. They also discuss Little Ricky's Christmas gifts and Ethel remarks that, "It seems like only yesterday when he was born." A flashback is the shown of Ricky, Fred and Ethel preparing for Lucy's trip to the hospital maternity ward (from "Lucy Goes to the Hospital"). Christmas morning arrives and the four friends are up early and dressed in Santa Clasus suits. They hear Little Ricky coming and they hurry into the kitchen as not to disenchant him with the appearance of four Santas. Suddenly, a fifth Santa shows up. However, the "real" St. Nick vanishes as the Ricardos and Mertzes look into the camera and gingerly proclaim, "Merry Christmas!" 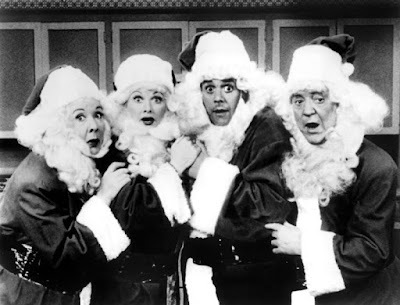 For the past three years, an I Love Lucy Christmas special has become an annual Yueltide tradition, each combing the "Christmas Episode" with a different classic episode from the show. This year is no exception. So, take note, Lucy aficionados. Tomorrow, Friday, December 2, 2016 (8:00-9:00 PM, ET/PT) CBS will broadcast an hour-long I Love Lucy Christmas Special featuring two back-to-back episodes - "The Christmas Episode" and the newly colourized "Lucy Gets in Pictures." "Lucy Gets in Pictures" was first aired during the fourth season of the series, on February 21, 1955. In the episode, Ricky arranges for Lucy to play a showgirl and Lucy is required to walk down a staircase wearing an enormous feathered headdress. * As part of the 2015 Lucy special, the "Christmas Episode" was broadcast entirely in colour for the first time - including the flashback sequences. It was shown along with "Lucy Does a TV Commercial" (also know as the "Vitametavegamin" episode), which was aired in colour for the first time. The 2014 Christmas special included "Lucy's Italian Movie," the grape-stomping episode. "Job Switching," the chocolate factory epispde. was shown in 2013.